Bar Charts are often referred to as 'Western Bar' or 'OHLC' charts. 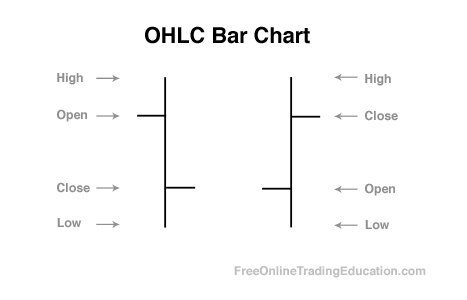 This acronym stands for Open, High, Low and Close chart. Data is plotted on the chart for the open, high, low and close of each period represented by the time frame. The top of the bar is the high, the bottom the low, left side hash mark is the open and the right side hash mark is the close. Practical Use: Technical analysts use Western Bar Charts to better determine the price action for each bar and to clean up the "noise" of candlestick charts while still getting the requisite data above and beyond what a line graph can provide.